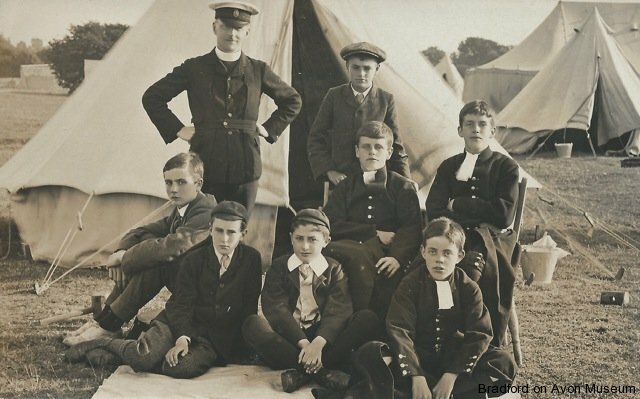 The Church Lads’ Brigade was a Church of England organisation that was first set up in 1891. A Bradford on Avon Company had come into existence by 1907 and was associated with Christ Church and with O.P. Skrine. Osmund Percy Skrine (1858-1924) was the seventh son of Henry Duncan Skrine of Warleigh Manor, Bathford and moved to Kingsfield Grove in Bradford in 1905 after a career in Ceylon and in Canada. He built a hall for the Brigade in Woolley Street, which subsequently became part of the New Road Garage until it was demolished to make way for housing in 2006. It was also used by Bradford Scouts and by the Bradford Crusaders football team, both of which were also linked to Christ Church. 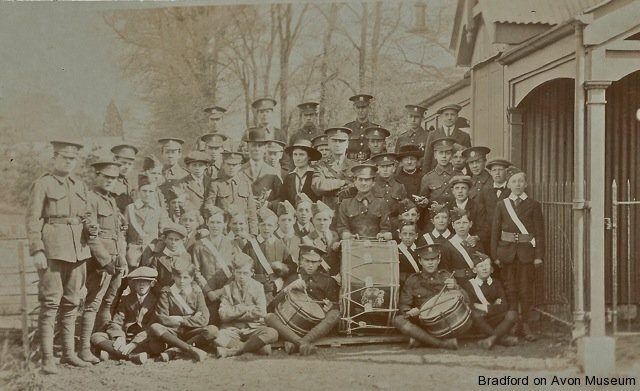 The photographs are from an album in Bradford on Avon Museum that was given by O.P. Skrine’s grandaughter. 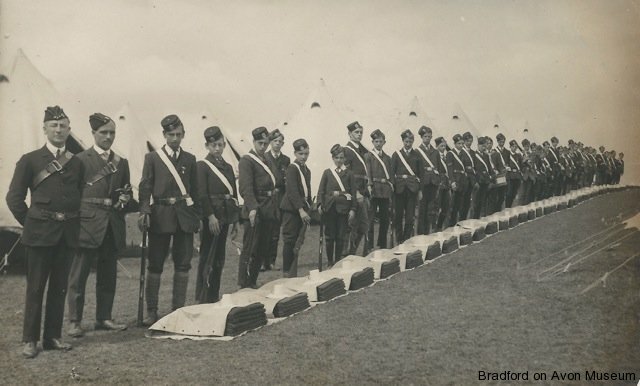 They are mainly of the camps where the Bradford Company joined others at Dawlish, Burnham and West Bay between 1907 and 1914 and feature parading, kit inspections and early field radio. They are all very militaristic with all the boys armed and the clergy uniformed too. 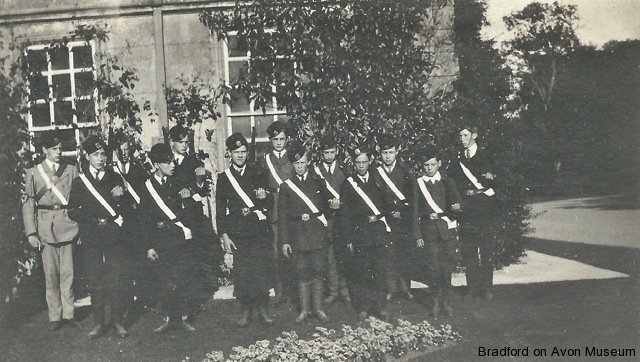 Part of the Bradford Company in the garden of a big house, which may have been Skrine’s home at Kingsfield Grove. The house was demolished after the Second World War and the land redeveloped into the present Kingsfield housing estate. 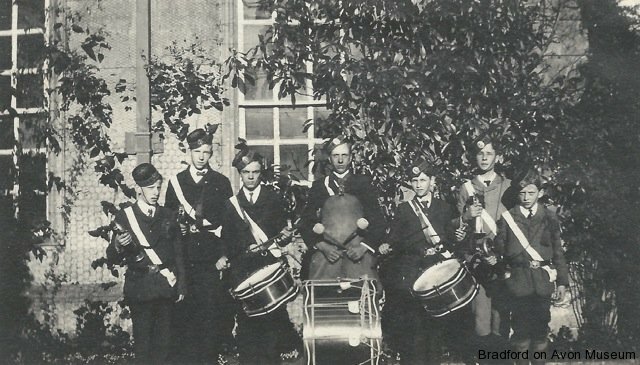 The drummers and buglers of the Bradford Church Lads’ Brigade outside the same house. Kit inspections at camp feature strongly in the photographs. Bradford Company seem to have been judged the best on a couple of occasions. Members of the Christ Church choir also attended the camp. Perhaps they were only there as visitors for a church parade service as some of them are wearing their choir outfits. The Vicar, in military uniform, is in the background. Food at camp was provided for all those attending by a field kitchen, cooked on wood-burning stoves. 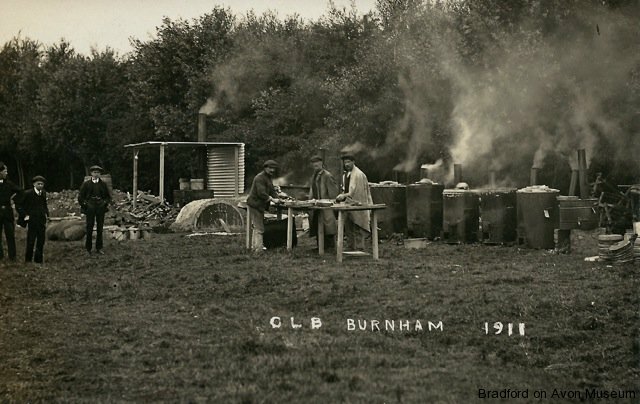 This was the kitchen at the 1911 camp at Burnham-on-Sea. 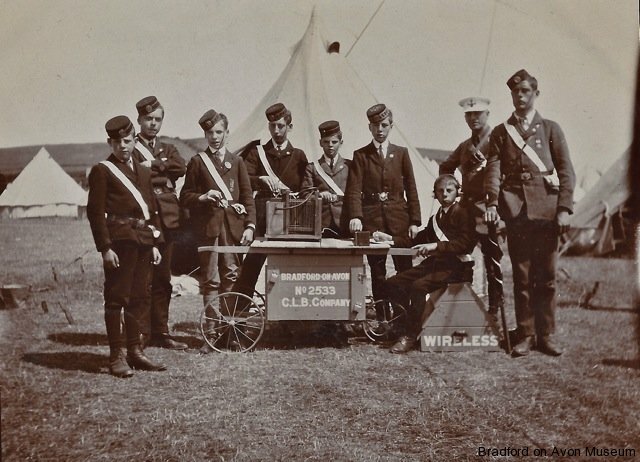 Bradford Company’s field wireless equipment and operators appear in several photographs. It would have been heavy and cumbersome because of the lead-acid accumulator batteries, so it was mounted on a three-wheel barrow that was towed by the boys. Another version of the barrow has two larger, spoked wheels that are sprung and must have handled better. This photograph was taken at West Bay, Dorset in 1913. This group photograph was taken in 1917, in the middle of the First World War. Some of the older members are in army uniform, perhaps home on leave. Many of the boys went on to serve in the war, some not to return. The building on the right, with corrugated iron walls and roof, is probably the drill hall on New Road.